Home / The Archives / Luuuuucky! I’m pretty lucky to have one of those jobs that is very open to the idea of me commuting to work by bike. Heck even the property manager of the building is cool about it. Why am I so lucky? Well its because I can bring my bike into my office. I don’t have to carry around a heavy lock and worry about it getting stolen and the bike doesn’t get beat up by the sun. 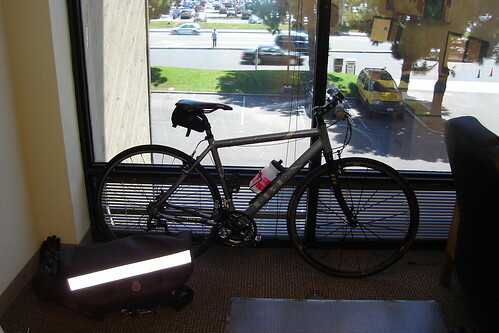 Here’s a pic of the Ibex Corrida in my office right beside the Banjo Brother’s Messenger Bag. I’ve been parking in the office for a few years and now I’d be really annoyed if I prevented from continuing to do it. You’re right about the added security without having to carry a lock, although sometimes I find myself wishing I had one with me when I need to make a stop somewhere on the way (like at the pub on the way home tonight). And keeping everything out of the weather is a bonus. I lug my gear in panniers, so it’s great to be able to leave them attached – especially when it comes time to go home and I can just chuck everything in and go. When I used to park outside, I’d strip off everything removable – lights, toolbag, pump – then replace it all when I left and that was pretty tedious. It’s a small but not insignificant consideration: if my employer did not allow me to bring my bike inside with me, they might not have me as their employee for long!